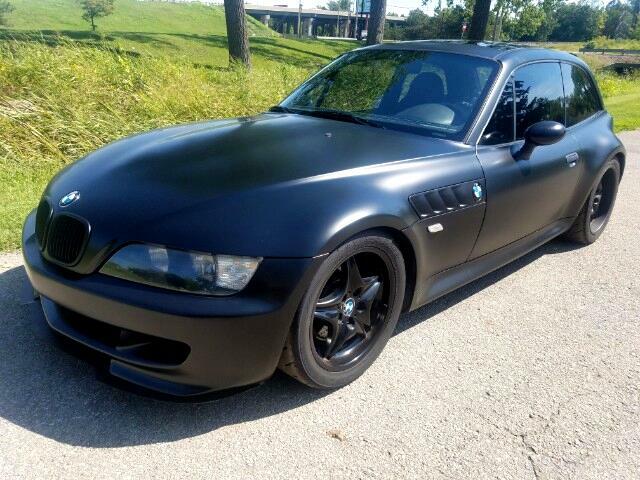 Used 1999 BMW M Coupe Sold in Merriam KS 66203 Kansas City Autosport Inc.
1999 BMW M Coupe 6 Speed. This was a customer's car that he decided to go all out on. We searched and searched for an M Coupe that we knew we wanted to add performance to and custom flare. Finally this one popped up, a low mileage completely stock M Coupe with heated seats. We had a lot of fun with the customer doing all these modifications but ultimately the customer now needs a back seat. The engine is stock. One of the biggest performance improvemtents was the lower geared differential along with the 6 speed transmission. It gives you much better off the line acceleration and plenty of top end with a 6th gear. 3.46 rear torsen differential, BC coilovers, e46 330i brake upgrade, e46 330i 6 speed transmission, lightened flywheel, TOYO RE888 tires, Magnus Walker MOMO steering wheel (stock steering wheel with airbag will be included), custom front splitter, rear spoiler and rear diffuser, 5-point remote harnesses, custom wrapped dash, multi-function bluetooth stereo, side vents are off non-M Z3 but M vents will be included, custom flat black vinyl wrap for paint protection (paint is Cosmos Black and front bumper is primered because license plate holes and running light holes were filled). Brake flush, oil change, brake light switch, fan clutch, left front ABS sensor, clutch master cylinder, water pump, thermostat, radiator, tie rods and belts. Car is caught up on services, maintenance and repairs and needs nothing. The customer had over $60,000 invested into this car. Message: Thought you might be interested in this 1999 BMW M Coupe.